Well. I’m not sure if it’s the residual exhaustion from the not-yet-completed move, or the fact that it’s turned cold here all of a sudden (I HATE the cold and tend toward hibernation mode when the temperatures drop), but I’ve had a hell of time trying to get my brain functioning well enough to offer up a reflection on the other night that might be in any way worthy. We started with dinner at Mr. Greenjeans in the Eaton Centre. Since one of our crew is a born-and-bred 905-er, it seemed appropriate to let him have the entirety of the suburbanite-coming-into-the-big-town experience. Mr. Greenjeans used to be THE go-to place for birthday parties in (junior) high school (they have a giant, share-with-the-whole-table, sundae called ‘Hats off to the Party’- it comes in a clear plastic top hat), complete with Emporium off to the side in which you could buy all kinds of crazy crap. Artie was pleased with the nod to his youth, and the evening was off to a great start. (Despite its position as a fixture in the mall- 34 years!- the place has done a good job of keeping up with current food trends. I had a great seared tuna sandwich- with a side of their buffalo chips, and a GIANT freakin’ beer. I’ll go back if in the neighbourhood and jonesin’ for some homey food- even if the Emporium is long gone). Then it was across the street to the Grande Dame that is Massey Hall. Fletch and Mar took their seats on the floor, and Artie and I made the looooooong climb up to the second balcony, but we were more than happy with the great view of the stage as the place quickly filled. One of the nice things about MH is its feeling of intimacy. For all that it holds 2500+ people, the lines of sight allowed me to pick out and wave to friends who were scattered around the joint before the lights went down. The Boys from Glasgow opened the show with Broken Glass Park, one of two new songs off their multidisc offering Celebrate: The Greatest Hits+. A strong song, and one that will bear a further listen or two in days to come. Then came the instantly recognizable opening notes of an oldie-and-oh-so-goodie, and the excitement level around us skyrocketed. Jim was not only in fantastic voice, his ambitious stage moves (and singular dance style- I say ‘singular’, but as Artie pointed out, more than once, ‘Jim dances like Fletch’) suggest that he has spent at least part of the ten+ years since the band last toured North America in a yoga studio. Pretty flexible for an older dude. Gotta say. I was impressed. As many friends commented, it was refreshing to see a performance that was completely without airs or pretension or attitude. The whole band was there to put on a great show and hang with a welcoming crowd. They seemed happy to be back in TO- as evidenced even the day before their return to MH- in a shining article in the Toronto Star. They certainly didn’t disappoint their loyal fan base. After a packed first set- which included great songs from the vault- they ended with New Gold Dream (81-82-83-84) before taking a break. Artie was beyond thrilled with the instrumental version of Speed Your Love to Me that started off set two- one of his favourites, and not one he thought to hear performed live. Charlie (who has retained a REMARKABLE amount of hair) and Mel (who has not) led the band through the loops and whorls of an engaging arrangement of the tune and got the energy level back up and running after the trip to the bar and the merch table (and, in our case, the walk back up all those flights of stairs). Then Jim retook the stage for I Travel, and Someone Somewhere in Summertime, one of my personal faves (referenced before here). Other incredibly solid offerings followed, until one tune blew all the wonder that had come before completely out of the water. Love the manpurse in that video, Jim. I think I came close to tears a couple of times as they played their Glaswegian hearts out and held the crowd in the palms of their hands for a those minutes. 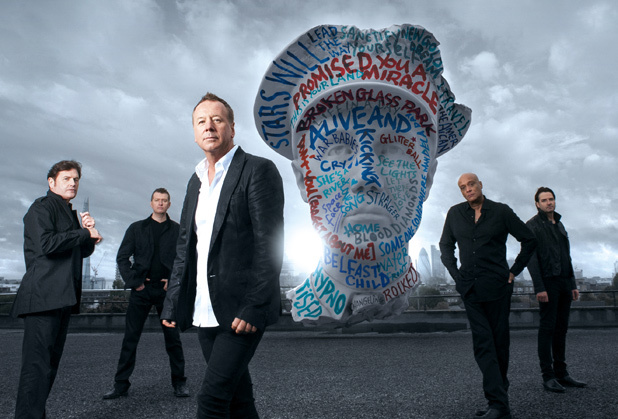 See the Lights was followed by ‘that song’ (Don’t You (Forget About Me), which, although it may be their most enduringly popular hit- and the only one to really make it big in the US market, isn’t really a Simple Minds song. I don’t have the same level of hate-on for it that some purists do- it’s a solid and now-iconic tune which evokes John Hughes-80s goodness- but it isn’t top of my list, for sure) which brought the entirety of the crowd to its collective feet. Which was fantastic since the follow up song, that ended the second set, was Promised You a Miracle. Artie and I re-enacted Guid’s now-patented charades move in an act of sincere homage. Miss you, Guid. Never one of my go-to SM tunes, but I think Tuesday’s performance might have changed that a little. They sure are. They are back, in a big way. And Toronto still loves them (despite some murmurings about the crowd being somewhat ‘lame’- we were all about the high energy groove up in the second balc). It has been a week (and more) of dealing with the mundane- the job/job search, the packing, the moving, the unpacking, the commuting, the packing, the cleaning, the trips to the storage space… Having something so out of the ordinary- something extraordinary in every way- happen in the midst of the chaos was a breath of fresh air that was most definitely needed. I think I might actually manage to make it through the rest of the move now. SO many thanks to Fletch, the founder of the fun, for getting the tickets, and to Artie and Mar (and everyone else who made it out to the show- even if we only managed a wave in passing) for contributing to a fantastic night. And to the band… well. Welcome back boys. I didn’t realize just how much I’d missed you. Thanks for showing us one HELL of a great time. You. Were. Magical. In that way that old friends keep on bringing the magic into life. Happy weekend, my friends. Old and new.